There are currently 3,703 users on this website. Can You Explain This Use Of Tax Stamps? Found this package tag with tax stamps on it with a registered mail cancel. 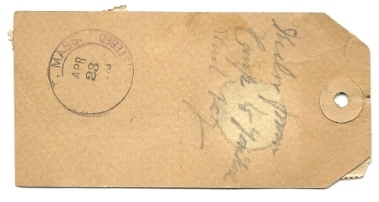 Valuable Insured Mail was handled same as registered mail with its chain of custody documented under special conditions mostly involving money, coins, and negotiable paper. This appears to be a personal package? Information needed on if there might be a valid need for there use or possibly invalid use for postage and fees, or??? Nice tag, these usages are not all that common, relatively few were saved. SCHEDULE A 14. 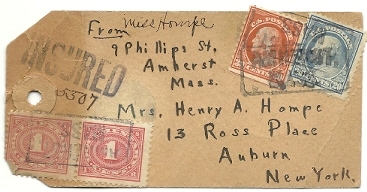 Parcel-post packages: Upon every parcel or package transported from one point in the United States to another by parcel post on which the postage amounts to 25 cents or more, a tax of 1 cent for each 25 cents or fractional part thereof charged for such trans�portation, to be paid by the consignor. No such parcel or package shall be transported until a stamp or stamps representing the tax due shall have been affixed thereto. This tax was paid for by the 1917 red documentaries. It took 0.3 seconds to lick this stamp.